Breaking Out of Traditional Holiday Looks Continued! Hello Fashionista's and Faithful Readers! Let me just start by saying thank you to all who come to my blog and take the time to read my entries as well as check out the ideas and photo's that I post on here! Now, my photos aren't the best quality, I don't have a fancy professional camera (I did and I broke it), they are just taken from my smart phone and so I don't have blur out options(if I do, I don't know how to), Other than lighting, I don't like to photo shop any of my photos, and I just simply pose and snap goes the phone!!! This Holiday Season I thought, why not put together some looks that are non traditional, you know, red and gold, red and black, and so forth! 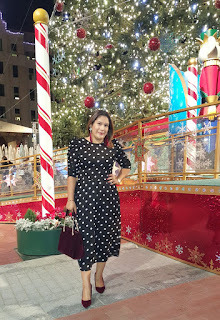 Red tends to be the color for the Season, don't get me wrong, I love red, but I just thought, there are so many other beautiful colors and patterns that I can combine to give me chic holiday looks!